Text is ascribed, without dissentient voice, to king Wăn, the founder of the Kâu dynasty, and his son Tan, better known as the duke of Kâu; and I have, in the preceding chapters, given reasons for accepting that view. As regards the portion ascribed to king Wăn, the evidence of the third of the Appendixes and the statement of Sze-mâ Khien are as positive as could be desired; and as regards that ascribed to his son, there is no ground for calling in question the received tradition. The Appendixes have all been ascribed to Confucius, though not with entirely the same unanimity. Perhaps I have rather intimated my own opinion that this view cannot be sustained. I have pointed out that, even if it be true, between six and seven centuries elapsed after the Text of the classic appeared before the Appendixes were written; and I have said that, considering this fact, I cannot regard its two parts as a homogeneous whole, or as constituting one book in the ordinary acceptation of that name. Before entering on the question of the authorship, a very brief statement of the nature and number of the Appendixes will be advantageous. Text is divided into two sections, called the Upper and Lower, or, as we should say, the first and second, and then the commentary on each section is made to form a separate Appendix. I have found it more convenient in the translation which follows to adopt a somewhat different arrangement. My first Appendix, in two sections, embraces the first and second 'wings,' consisting of remarks on the paragraphs by king Wăn in the two parts of the Text. My second Appendix, in two sections, embraces the third and fourth 'wings,' consisting of remarks on the symbolism of the duke of Kâu in his explanation of the individual lines of the hexagrams. My third Appendix, in two sections, embraces the fifth and sixth 'wings,' which bear the name in Chinese of 'Appended Sentences,' and constitute what is called by many 'the Great Treatise.' Each wing has been divided into twelve chapters of very different length, and I have followed this arrangement in my sections. This is the most important Appendix. It has less of the nature of commentary than the previous four wings. While explaining much of what is found in the Text, it diverges to the origin of the trigrams, the methods pursued in the practice of divination, the rise of many arts in the progress of civilisation, and other subjects. My fourth Appendix, also in two sections, forms the seventh 'wing.' It is confined to an amplification of the expositions of the first and second hexagrams by king Wăn and his son, purporting to show how they may be interpreted of man's nature and doings. My fifth Appendix is the eighth 'wing,' called 'Discourses on the Trigrams.' It treats of the different arrangement of these in respect of the seasons of the year and the cardinal points by Fû-hsî and king Wăn. It contains also one paragraph, which might seem to justify the view that there is a mythology in the Yî. [paragraph continues] 'a Treatise on the Sequence of the Hexagrams,' intended to trace the connexion of meaning between them in the order in which they follow one another in the Text of king Wăn. My seventh Appendix is the tenth 'wing,' an exhibition of the meaning of the 64 hexagrams, not taken in succession, but promiscuously and at random, as they approximate to or are opposed to one another in meaning. to enquire next who wrote them, and especially whether it be possible to accept the dictum that they were all written by Confucius. If they have come down to us, bearing unmistakeably the stamp of the mind and pencil of the great sage, we cannot but receive them with deference, not to say with reverence. If, on the contrary, it shall appear that with great part of them he had nothing to do, and that it is not certain that any part of them is from him, we shall feel entirely at liberty to exercise our own judgment on their contents, and weigh them in the balances of our reason. superscription of Confucius. There is not a single sentence in any one of them ascribing it to him. I gave in the first chapter, on p. 2, the earliest testimony that these treatises were produced by him. It is that of Sze-mâ Khien, whose 'Historical Records' must have appeared about the year 100 before our era. He ascribes all the Appendixes, except the last two of them, which he does not mention at all, expressly to Confucius; and this, no doubt, was the common belief in the fourth century after the sage's death. This is followed by seven paragraphs expanding its statements, and we come to the last one of the chapter which says,--'The Master said, "Such is the import of the statement that there are four things in the Yî, characteristic of the way of the sages."' I cannot understand how it could be more fully conveyed to us that the compiler or compilers of this Appendix were distinct from the Master whose words they quoted, as it suited them, to confirm or illustrate their views. In the fourth Appendix, again, we find a similar occurrence of the formula of quotation. It is much shorter than the third, and the phrase, 'The Master said,' does not come before us so frequently; but in the thirty-six paragraphs that compose the first section we meet with it six times. confidence which we have been accustomed to place in the view that 'the ten wings' were to be ascribed to him unhesitatingly. The view has broken down in the case of three of them;--possibly there is no sound reason for holding the Confucian origin of the other seven. 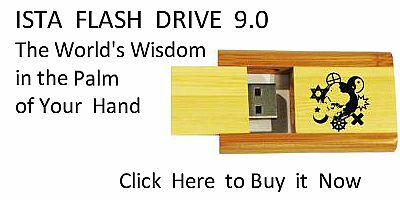 I could not characterise Confucius as 'the chief of philosophers,' though he was a great moral philosopher, and has been since he went out and in among his disciples, the best teacher of the Chinese nation. But from the first time my attention was directed to the Yî, I regretted that he had stooped to write the parts of the Appendixes now under remark. It is a relief not to be obliged to receive them as his. Even the better treatises have no other claim to that character besides the voice of tradition, first heard nearly 400 years after his death. 4. I return to the Appendixes, and will endeavour to give a brief, but sufficient, account of their contents. and sometimes even one of them is deemed sufficient. In this way some technical characters appear which are not found in the Text. The lines, for instance, and even whole trigrams are distinguished as kang and zâu, hard or strong' and 'weak or soft.' The phrase Kwei-shăn, 'spirits,' or 'spiritual beings,' occurs, but has not its physical signification of 'the contracting and expanding energies or operations of nature.' The names Yin and Yang, mentioned above on pp. 15, 16, do not present themselves. I delineated, on p. 11, the eight trigrams of Fû-hsî, and gave their names., with the natural objects they are said to represent, but did. not mention the attributes, the virtutes, ascribed to them. Let me submit here a table of them, with those qualities, and the points of the compass to which they are referred. I must do this because king Wăn made a change in the geographical arrangement of them, to which reference is made perhaps in his text and certainly in this treatise. He also is said to have formed an entirely different theory as to the things represented by the trigrams, which it will be well to give now, though it belongs properly to the fifth Appendix. The natural objects and phenomena thus represented are found up and down in the Appendixes. It is impossible to believe that the several objects were assigned to the several figures on any principles of science, for there is no indication of science in the matter: it is difficult even to suppose that they were assigned on any comprehensive scheme of thought. Why are tui and khân used to represent water in different conditions, while khân, moreover, represents the moon? How is sun set apart to represent things so different as wind and wood? At a very early time the Chinese spoke of 'the five elements,' meaning water, fire, wood, metal, and earth; but the trigrams were not made to indicate them, and it is the general opinion that there is no reference to them in the Yî 33:1. Again, the attributes assigned to the trigrams are learned mainly from this Appendix and the fifth. We do not readily get familiar with them, nor easily accept them all. It is impossible for us to tell whether they were a part of the jargon of divination before king Wăn, or had grown up between his time and that of the author of the Appendixes. King Wăn altered the arrangement of the trigrams so that not one of them should stand at the same point of the compass as in the ancient plan. He made them also representative of certain relations among themselves, as if they composed a family of parents and children. It will be sufficient at present to give a table of his scheme. In a similar way the paragraphs on all the other 63 hexagrams are gone through; and, for the most part, with success. The conviction grows upon the student that the writer has on the whole apprehended the mind of king Wăn. in this Appendix. It has not yet, however, received the semi-physical, semi-metaphysical signification which the comparatively modern scholars of the Sung dynasty give to it. There are two passages where it is found;--the second paragraph on Khien, the fifteenth hexagram, and the third on Făng, the fifty-fifth. By consulting them the reader will be able to form an opinion for himself. The term kwei denotes specially the human spirit disembodied, and shăn is used for spirits whose seat is in heaven. I do not see my way to translate them, when used binomially together, otherwise than by spiritual beings or spiritual agents. is now vigorous and abundant, and now dull and void, growing and diminishing according to the seasons, that constitutes the traces of making and transformation; why should the writer further speak of the Kwei-shăn?' He replied, 'When he uses the style of "heaven and earth," he is speaking of the result generally; but in ascribing it to the Kwei-shăn, he is representing the traces of their effective interaction, as if there were men (that is, some personal agency) bringing it about 35:1.' This solution merely explains the language away. When we come to the fifth Appendix, we shall understand better the views of the period when these treatises were produced. The author of the Appendix delights to dwell on the changing phenomena taking place between heaven and earth, and which he attributes to their interaction; and he was penetrated evidently with a sense of the harmony between the natural and spiritual worlds. It is this sense, indeed, which vivifies both the thwan and the explanation of them. [paragraph continues] If there were reason to think that it came in any way from Confucius, I should fancy that I saw him sitting with a select class of his disciples around him. They read the duke's Text column after column, and the master drops now a word or two, and now a sentence or two, that illuminate the meaning. The disciples take notes on their tablets, or store his remarks in their memories, and by and by they write them out with the whole of the, Text or only so much of it as is necessary. Whoever was the original lecturer, the Appendix, I think, must have grown up in this way. It would not be necessary to speak of it at greater length, if it were not that the six paragraphs on the symbols of the duke of Kâu are always preceded by one which is called 'the Great Symbolism,' and treats of the trigrams composing the hexagram, how they go together to form the six-lined figure, and how their blended meaning appears in the institutions and proceedings of the great men and kings of former days, and of the superior men of all time. The paragraph is for the most part, but by no means always, in harmony with the explanation of the hexagram by king Wăn, and a place in the Thwan Kwan would be more appropriate to it. I suppose that, because it always begins with the mention of the two symbolical trigrams, it is made, for the sake of the symmetry, to form a part of the treatise on the Symbolism of the Yî. The fifty-ninth hexagram, called Hwân is formed by the trigrams Khân , representing water, and Sun , representing wind, and it is said on it:--(The symbol of) water and (that of wind) above it form Hwân. The ancient kings, in accordance with this, presented offerings to God, and established the ancestral temple.' The union of the two trigrams suggested to king Wăn the idea of dissipation in the alienation of men from the Supreme Power, and of the minds of parents from their children; a condition which the wisdom of the ancient kings saw could best be met by the influences of religion. The writer moralises from them in an edifying manner. There is ingenuity, and sometimes instruction also, in what he says, but there is no mystery. Chinese scholars and gentlemen, however, who have got some little acquaintance with western science, are fond of saying that all the truths of electricity, heat, light, and other branches of European physics, are in the eight trigrams. When asked how then they and their countrymen have been and are ignorant of those truths, they say that they have to learn them first from western books, and then, looking into the Yî, they see that they were all known to Confucius more than 2000, years ago. The vain assumption thus manifested is childish; and until the Chinese drop their hallucination about the Yî as containing all things that have ever been dreamt of in all philosophies, it will prove a stumbling-block to them, and keep them from entering on the true path of science. figures, made by the manipulations of divination, apart from any sentence or oracle concerning them delivered by king Wăn or his son. There is therefore the system of the Yî as well as the book of the Yî. The definition of the name which is given in one paragraph will suit them both:--'Production and reproduction is what is called (the process of) change 39:1.' In nature there is no vacuum. When anything is displaced, what displaces it takes the empty room. And in the lineal figures, the strong and the weak lines push each other out. the significance, when looked at from certain points of view, which have been determined for us by king Wăn and the duke of Kâu. But this does not amount to divination. How can the lines be made to serve this purpose? The Appendix professes to tell us. ago, in the days of Fû-hsî, for I cannot repress doubts of his historical personality; but as soon as we tread the borders of something like credible history, we find it existing. In the Shû King, in a document that purports to be of the twenty-third century B. C. 40:3, divination by means of the tortoise-shell is mentioned; and somewhat later we find that method continuing, and also divination by the lineal figures, manipulated by means of the stalks of a plant 40:4, the Ptarmica Sibirica 40:5, which is still cultivated on and about the grave of Confucius, where I have myself seen it growing. a subtle and invisible virtue that fitted them for use in divining. modifications and different states, then the doctrine of the philosopher of Samos was different from that of the Yî 43:1, in which numbers come in only as aids in divining to form the hexagrams. Of course all divination is vain, nor is the method of the Yî less absurd than any other. The Chinese themselves have given it up in all circles above those of the professional quacks, and yet their scholars continue to maintain the unfathomable science and wisdom of these appended treatises! to, but at the same time with substantival force, denoting what has the quality which the name denotes? Had the doctrine of a primary matter of an ethereal nature, now expanding and showing itself full of activity and power as yang, now contracting and becoming weak and inactive as yin:--had this doctrine become matter of speculation when this Appendix was written? The Chinese critics and commentators for the most part assume that it had. P. Regis, Dr. Medhurst, and other foreign Chinese scholars repeat their statements without question. I have sought in vain for proof of what is asserted. It took more than a thousand years after the closing of the Yî to fashion in the Confucian school the doctrine of a primary matter. We do not find it fully developed till the era of the Sung dynasty, and in our eleventh and twelfth centuries 44:1. To find it in the Yî is the logical, or rather illogical, error of putting 'the last first.' Neither creation nor cosmogony was before the mind of the author whose work I am analysing. His theme is the Yî,--the ever-changing phenomena of nature and experience. There is nothing but this in the 'Great Treatise' to task our powers;--nothing deeper or more abstruse. In the latter passage it is more difficult to determine the exact meaning. The writer says, that 'by the odd numbers assigned to heaven and the even numbers assigned to earth, the changes and transformations are effected, and the spirit-like agencies kept in movement;' meaning that by means of the numbers the spirit-like lines might be formed on a scale sufficient to give a picture of all the changing phenomena, taking place, as if by a spiritual agency, in nature. Medhurst contents himself on it with giving the explanation of Kû Hsî, that 'the kwei-shăns refer to the contractions and expandings, the recedings and approachings of the productive and completing powers of the even and odd numbers 45:2.' Canon McClatchie does not follow his translation of the former passage and give here 'demons and gods,' but we have 'the Demon-god (i.e. Shang Tî) 45:3.' I shall refer to this version when considering the fifth Appendix. and again as a verb. I must refer the reader to the translation and notes for its various significance, subjoining in a note a list of the places where it occurs 46:1. Much more might be said on the third Appendix, for the writer touches on many other topics, antiquarian and speculative, but a review of them would help us little in the study of the leading subject of the Yî. In passing on to the next treatise, I would only further say that the style of this and the author's manner of presenting his thoughts often remind the reader of 'the Doctrine of the Mean.' I am surprised that 'the Great Treatise' has never been ascribed to the author of that Doctrine, Žze-sze, the grandson of Confucius, whose death must have taken place between B. C. 400 and 450.
confined to an exposition of the Text on the first and second hexagrams, being an attempt to show that what is there affirmed of heaven and earth may also be applied to man, and that there is an essential agreement between the qualities ascribed to them, and the benevolence, righteousness, propriety, and wisdom, which are the four constituents of his moral and intellectual nature. on their children;' but do the parents themselves escape the curse? It is to be regretted that this short treatise, the only 'wing' of the Yî professing to set forth its teachings concerning man as man, does not attempt any definite reply to this question. I leave it, merely observing that it has always struck me as the result of an after-thought, and a wish to give to man, as the last of 'the Three Powers,' a suitable place in connexion with the Yî. The doctrine of 'the Three Powers' is as much out of place in Confucianism as that of 'the Great Extreme.' The treatise contains several paragraphs interesting in themselves, but it adds nothing to our understanding of the Text, or even of the object of the appended treatises, when we try to look at them as a whole. which is made up of 'Remarks on the Trigrams.' It is shorter than the fourth, consisting of only 22 paragraphs, in some of which the author rises to a height of thought reached nowhere else in these treatises, while several of the others are so silly and trivial, that it is difficult, not to say impossible, to believe that they are the production of the same man. 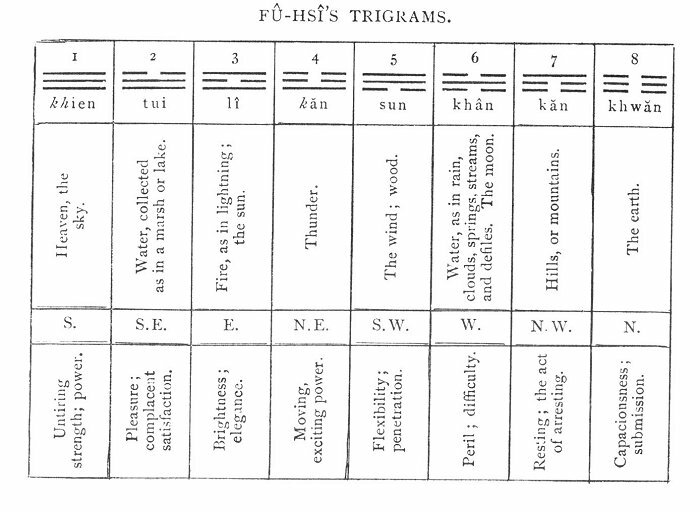 We find in it the earlier and later arrangement of the trigrams,--the former, that of Fû-hsî, and the latter, that of king Wăn; their names and attributes; the work of God in nature, described as a progress through the trigrams; and finally a distinctive, but by no means exhaustive, list of the natural objects, symbolised by them. figures, and the system of divination by them),'in order to give mysterious assistance .to the spiritual Intelligences, they produced (the rules for the use of) the divining plant.' Perhaps this means no more than that the lineal figures were made to 'hold the mirror up to nature,' so that men by the study of them would understand more of the unseen and spiritual operations, to which the phenomena around them were owing, than they could otherwise do. 'Khien is (the symbol of) heaven, and hence is styled father. From this language has come the fable of a marriage between Khien and Khwăn, from which resulted the six other trigrams, considered as their three sons and three daughters; and it is not to be wondered at, if some men of active and ill-regulated imaginations should see Noah and his wife in those two primary trigrams, and in the others their three sons and the three sons' wives. Have we not in both cases an ogdoad? But I have looked in the paragraph in vain for the notion of a marriage-union between heaven and earth. other trigrams are not 'produced 50:1' by a marriage-union, but from the application, literally the seeking, of one of them of Khwăn as much as of Khien--addressed to the other 50:2. This way of speaking of the trigrams, moreover, as father and mother, sons and daughters, is not so old as Fû-hsî; nor have we any real proof that it originated with king Wăn. It is not of 'the highest antiquity.' It arose some time in 'middle antiquity,' and was known in the era of the Appendixes; but it had not prevailed then, nor has it prevailed since, to discredit and supersede the older nomenclature. We are startled when we come on it in the place which it occupies. And there it stands alone. It is not entitled to more attention than the two paragraphs that precede it, or the eight that follow it, none of which were thought by P. Regis worthy to be translated. I have just said that it stands 'alone.' Its existence, however, seems to me to be supposed in the fourth chapter, paragraphs 28-30, of the third Appendix, Section ii; but there only the trigrams of 'the six children' are mentioned, and nothing is said of 'the parents.' Kăn, khân, and kăn are referred to as being yang, and sun, lî, and tui as being yin. What is said about them is trifling and fanciful. God is here named Tî, for which P. Regis gives the Latin 'Supremus Imperator,' and Canon McClatchie, after him, 'the Supreme Emperor.' I contend that 'God' is really the correct translation in English of Tî; but to render it here by 'Emperor' would not affect the meaning of the paragraph. Kû Hsî says that 'by Tî is intended the Lord and Governor of heaven;' and Khung Ying-tâ, about five centuries earlier than Kû, quotes Wang Pî, who died A.D. Shoots full perfection through the swelling year. Prudish readers have found fault with some of Thomson's expressions, as if they savoured of pantheism. The language of the Chinese writer is not open to the same captious objection. Without poetic ornament, or swelling phrase of any kind, he gives emphatic testimony to God as renewing the face of the earth in spring, and not resting till He has crowned the year with His goodness. by the six 'children,' or minor trigrams,--water and fire, thunder and wind, mountains and collections of water. Kû Hsî says, that there is that in the paragraph which he does not understand. Some Chinese scholars, however, have not been far from descrying the light that is in it. Let Liang Yin, of our fourteenth century, be adduced as an example of them. He says:--'The spirit here simply means God. God is the personality (literally, the body or substantiality) of the Spirit; the Spirit is God in operation. He who is lord over and rules all things is God; the subtle presence and operation of God with all things is by His Spirit.' The language is in fine accord with the definition of shăn or spirit, given in the 3rd Appendix, Section i, 32. In reviewing the second of these Appendixes, I was led to speak of the original significance of the trigrams, in opposition to the views of some Chinese who pretend that they can find in them the physical truths discovered by the researches of western science. May I not say now, after viewing the phase of them presented in these paragraphs, that they were devised simply as aids to divination, and partook of the unreasonableness and uncertainty belonging to that? affairs is a topic never long absent from the writer's mind. He is firmly persuaded that 'the fashion of the world passeth away.' Union is sure to give place to separation, and by and by that separation will issue in re-union. There is nothing in the treatise to suggest anything about its authorship; and as the reader will see from the notes, we are perplexed occasionally by meanings given to the names that differ from the meanings in the Text. Žâ Kwâ Kwan, or 'Treatise on the Lineal Figures taken promiscuously,'--not with regard to any sequence, but as they approximate, or are opposed, to one another in meaning. It is in rhyme, moreover, and this, as much as the meaning, determined, no doubt, the grouping of the hexagrams. The student will learn nothing of value from it; it is more a 'jeu d'esprit' than anything else. 31:31:1 Regis' Y-King, vol. ii, p 576. 33:33:1 See Kâo Yî's Hâi Yü Žhung Khâo, Book I, art. 3 (1790). 38:38:1 = , the sun, placed over , a form of the old (= ), the moon. 39:39:1 III, i, 29 (chap. 5. 6). 39:39:2 III, i, 20 (chap. 4. 1). 40:40:1 III, i, 38 (chap. 8. 1). 40:40:2 Doctrine of the Mean, chap. xxii. 40:40:3 The Shû II, ii, 18. 40:40:4 The Shû V, iv, 20, 31. 40:40:5 See Williams' Syllabic Dictionary on the character . 41:41:1 A remarkable instance is given by Lîu Kî (of the Ming dynasty, in the fifteenth century) in a story about Shâo Phing, who had been marquis of Tung-ling in the time of Žhin, but was degraded tinder Han. Having gone once to Sze-mâ Ki-kû, one of the most skilful diviners of the country, and wishing to know whether there would be a brighter future for him, Sze-mâ said, 'Ah! is it the way of Heaven to love any (partially)? Heaven loves only the virtuous. What intelligence is possessed by spirits? They are intelligent (only) by their connexion with men. The divining stalks are so much withered grass; the tortoise-shell is a withered bone. They are but things, and man is more intelligent than things. Why not listen to yourself instead of seeking (to learn) from things?' The whole piece is in many of the collections of Kû Wăn, or Elegant Writing. 42:42:1 These numbers are commonly derived from the River Scheme, in the outer sides of which are the corresponding marks:-- , opposite to ; ,opposite to ; opposite to ; and , opposite to . Hence the number 6 is assigned to , 7 to , 8 to , and 9 to . Hence also, in connexion with the formation of the figures by manipulation of the stalks, 9 becomes the number symbolical of the undivided line, as representing Khien and 6 of the divided line, as representing Khwăn But the late delineation of the map, as given on p. 15, renders all this uncertain, so far as the scheme is concerned. The numbers of the hsiang, however, may have been fixed, must have been fixed indeed, at an early period. 43:43:1 See the account of Pythagoras and his philosophy in Lewes' History of Philosophy, pp. 18-38 (1871). 43:43:2 See Section i, 24, 32, 35; Section ii, 28, 29, 30, 35. 45:45:1 Dissertation on the Theology of the Chinese, pp. 111, 112. 45:45:2 Theology of the Chinese, p. 122. 45:45:3 Translation of the Yî King, p. 312. 46:46:1 Section i, 23, 32, 51, 58, 62, 64, 67, 68, 69, 73, 76, 81; Section ii, 11, 15, 33, 34, 41, 45. 47:47:2 Section i, 34. This is the only paragraph where kwei-shăn occurs. 50:50:1 But the Chinese term Shăng , often rendered 'produced,' must not be pressed, so as to determine the method of production, or the way in which one thing comes from another. 50:50:2 The significance of the mythological paragraph is altogether lost in Canon McClatchie's version:--'Khien is Heaven, and hence he is called Father; Khwăn is Earth, and hence she is called Mother; Kăn is the first male, and hence he is called the eldest son,' &c. &c.
50:50:3 The reader will understand the difference in the two arrangements better by a reference to the circular representations of them on Plate III. 51:51:1 E. g. 1, 23, 24:--'Observant etiam philosophi (lib. 15 Sinicae philosophiae Sing-11) principem. Wăn-wang antiquum octo symbolorum, unde aliae figurae omnes pendent, ordinem invertisse; quo ipsa imperii suis temporibus subversio graphice exprimi poterat, mutatis e naturali loco, quem genesis dederat, iis quatuor figuris, quae rerum naturalium pugnis ac dissociationibus, quas posterior labentis anni pars afferre solet, velut in antecessum, repraesentandis idoneae videbantur; v. g. si symbolum Lî, ignis, supponatur loco symboli Khân, aquae, utriusque elementi inordinatio principi visa est non minus apta ad significandas ruinas et clades reipublicae male ordinatae, quam naturales ab hieme aut imminente aut saeviente rerum generatarum corruptiones.' See also pp. 67, 68.